Since incorporation in 1893, the City of Rocklin has had two of its police officers killed in the line of duty while serving our community. In our memories their stories live on and in our hearts their lives hold special meaning. May we always remember the ultimate sacrifice they made for humanity and for the community of Rocklin. On October 9, 2005, at about 4AM, Rocklin Police Officer Matt Redding was struck and killed by a vehicle being operated by an intoxicated driver. Officer Redding was closing off a portion of Highway 65 near Stanford Ranch Road as other Rocklin PD officers were assisting another law enforcement agency conduct a high-risk vehicle stop. As he finished laying out a cone pattern, a pickup truck pulled out of the lane of exiting traffic towards Officer Redding. Officer Redding tried to jump out of the way, but he was struck by the vehicle, which then attempted to flee the scene. The other Rocklin officers saw the collision and chased the fleeing suspect. The driver was arrested and charged with DUI, felony hit and run, and manslaughter. The charges were later upgraded to second degree murder, gross vehicular manslaughter with enhancements, and evading arrest. He was convicted of second-degree murder and sentenced to serve 15 years to life in state prison.Officer Redding was taken to Sutter Roseville Hospital where he died from his injuries on October 9, 2005. 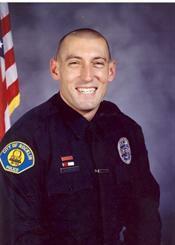 Officer Redding had served with the Rocklin Police Department for 4 years. He is survived by his fiancé, parents and brother. For more information about Officer Matt Redding, visit the Matt Redding Foundation website at www.mattreddingfoundation.org. On February 18, 1914, at about 11:00PM, Rocklin City Marshal Sam Renaldi was shot and killed by saloon owner Uledi Holmes, owner of Holmes Saloon located on Railroad Avenue, across the street from the Rocklin railroad depot, over a disagreement about town curfew. Residents near the commercial district of Rocklin often complained about late noise from Rocklin’s seven saloons, so Rocklin’s Board of Trustees ordered Marshal Renaldi to enforce Rocklin’s 12-midnight saloon curfew. They also told Renaldi to ensure that saloons were keeping empty beer kegs off the sidewalk. Marshal Renaldi had cited the saloon owner earlier in the month. On February 18th, 1914, after the same saloon owner had threatened an employee by gun point to return to work, he challenged the Marshal to a showdown. The Marshal, his deputy, and the deputy’s son were trying to decide how to deal with the situation at the town stable on Front Street when the saloon owner, who had been drinking for most of the afternoon, appeared at 11 PM. Deputy Marshal Willard’s son, Alfred, met the saloon owner at the entry to try to calm him down and Marshal Renaldi ordered the saloon owner to surrender. At this point the owner reached back for his pistol and Marshal Renaldi fired hitting the owner in the stomach. The owner fired, hitting Marshal Renaldi in the right side. Marshal Renaldi fired three times again, hitting the owner above the heart, in the right arm and in the right shoulder. Both men slumped to the stable floor mortally wounded. Both men were taken to Sacramento hospitals for treatment, but they died the next day, on February 19, 1914. For more details ofCity Marshal Sam Renaldi, visit the Rocklin Historical Society website at www.rocklinhistory.org.